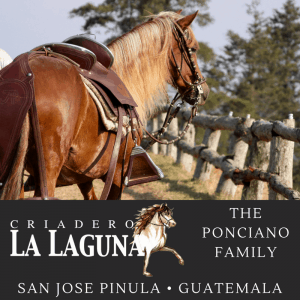 Criadero La Laguna is owned by the Ponciano Family and is located in San Jose Pinula, Guatemala. Only 40 minutes outside of the capital city of Guatemala 50 minutes from the airport, you will find yourself in 550 acres of steep mountains filled with oak and cypress trees and a growing organic coffee plantation. Four generations of the Ponciano family have enjoyed the Peruvian Horse on their beautiful finca (ranch). Criadero La Laguna is home to around 30 Peruvian horses from international bloodlines. Our foundations horses MVH Predilecto de Larache and MVH Melodia de Larache are direct offspring from the internationally renowned MSCRL Magistrado. This base of bloodlines, combined with the North American Champion of Champions Breeding Stallion MCD Coronado, are producing horses with incredible pisos, strength & beauty. We have produced national and international Champion horses through our breeding program. We strive to produce strong, well rounded & trained horses through our breeding and training program. Every one of our horses are handled daily from weaning on, making them easy to handle with great minds. We ride ALL of our horses in our extreme mountain terrain – our trail horses are our national championship winning horses! Come visit Criadero La Laguna in Guatemala and experience our incredible horses!